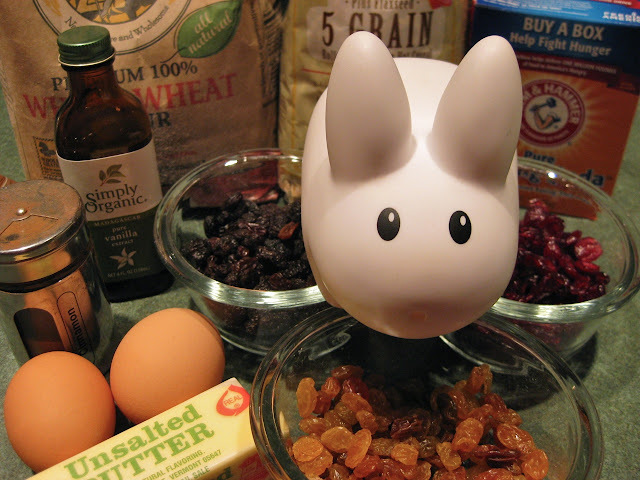 Pipkin's feeling a lot better and his energy is back, so it's back to the kitchen to make his favourite 5 Grain Cranberry Raisin Cookies, a recipe he's adapted from a recipe on a package of Bob's Red Mill 5 Grain Cereal. Pipkin mixes 5 Grain Cereal with whole wheat flour, eggs, butter, brown sugar and a healthy dose of cranberries, dark and golden raisins. The 5 Grain Cereal is blend of whole grain oats, wheat, rye, barley and flaxseed. These cookies are practically healthy. 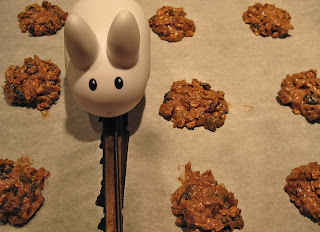 He's left out the coconut flakes and the nuts, wanting a sweeter, more moist cookie. 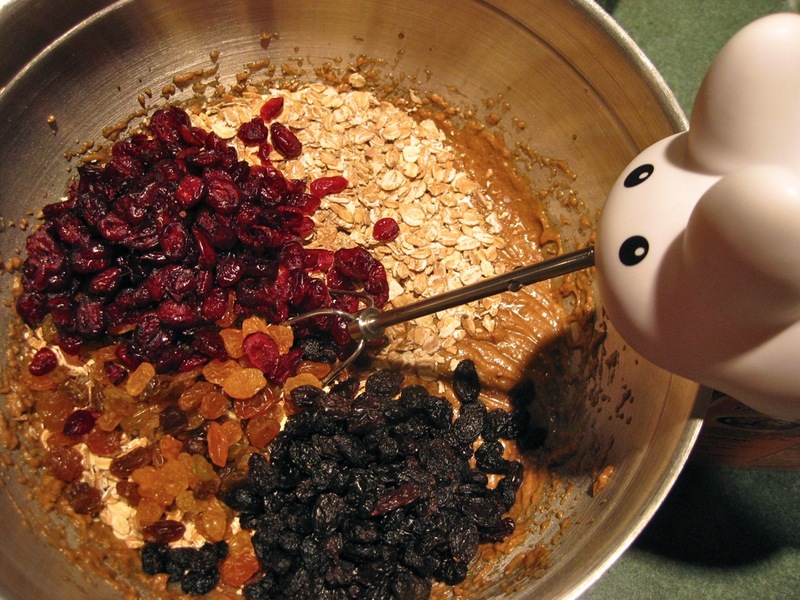 If you'd like the original recipe, pick up a package of 5 Grain Cereal from Bob's Red Mill. 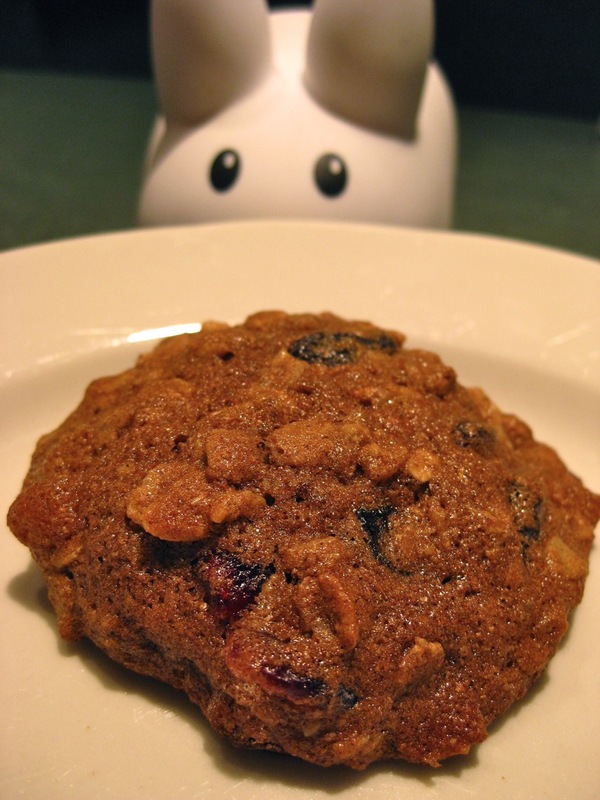 It's great for making these cookies, but it's also tasty as a hot cereal for breakfast. To print the recipe below, click here. Preheat oven to 375 degrees Fahrenheit. Line a couple of cookie sheets with parchment paper and set aside. In a large bowl, sift together flour, baking soda, salt and cinnamon. In another bowl, cream butter and sugar until smooth, then blend in water and vanilla. Beat eggs and add to butter mixture. Stir flour mixture into the egg and butter mixture. Add cereal, cranberries and raisins. Mix well. Drop rounded spoonfuls onto prepared cookie sheets. Bake 10-12 minutes. When done, edges should be lightly brown.